Previous to this I have reviewed the Savage Alchemy beard butters in the Obsidian and Kyanite scents. The beard butter has not quite done what I would expect from a butter but it hasn’t totally failed. It is very hard for a beard butter, previous butters that I have used have been soft and some have had a whipped consistency. Also it hasn’t been as nourishing as I would expect from a butter but having said that, it hasn’t fallen far short and I gave it a score of 90 out of 100. It is made from all natural ingredients which are Shea Butter, Cocoa Butter & Jojoba oil and as I said, it is very firm for a beard butter. The Selenite scent however is spot on! It is a blend of Sweet Orange, Star Anise & Nutmeg and honestly, if I had seen that scent blend with a view to buying it, I would have chosen not to buy and I would have missed out on an amazing scent! The sweet and citrus Orange is followed by a very nice spice and slight warmth and the scent blend works so very well. 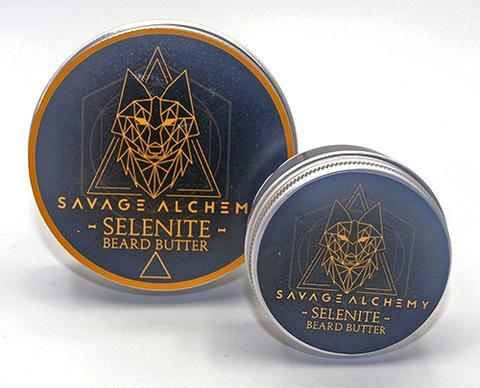 The Savage Alchemy Selenite beard butter comes in a screw top tin and is available as 30g for £6.99 or 60g for 12.99 from the website.